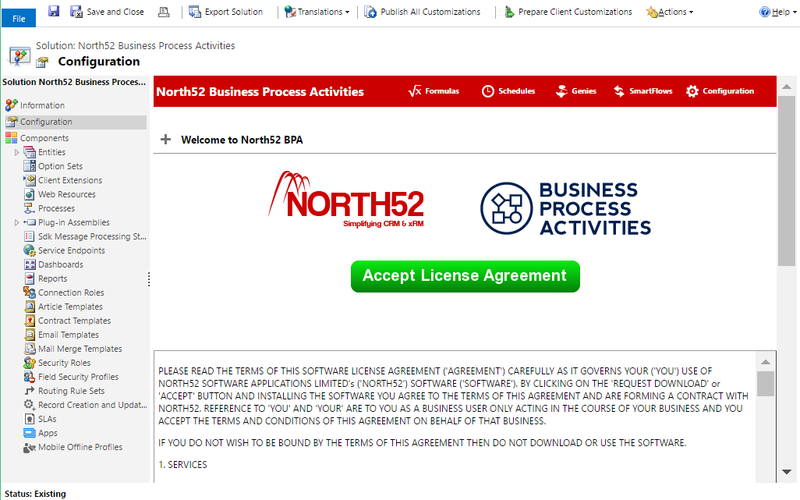 After you install North52 BPA you will need to accept the license agreement before you can create & use any formulas. The following set of steps will walk you through this process. Navigate to the list of solutions within your CRM deployment as shown in the first screenshot below. When the list appears double click on the North52 Business Process Activities one. Next click on the left hand navigation link named 'Configuration'. Now you should see two buttons as shown in the second screenshot. Click on the 'Accept license Agreement' button to accept the license. The process should take around 10 seconds & you should see the final screenshot below if all goes well.